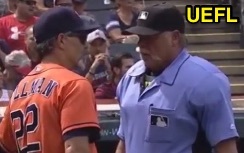 HP Umpire Jim Joyce ejected Astros Manager AJ Hinch for arguing a ball (foul no-call) and wild-pitch call in the bottom of the 3rd inning of the Astros-Indians game. With two out and the bases loaded, Indians batter Lonnie Chisenhall attempted to check his swing on a 2-2 curveball from Indians pitcher David Paulino, resulting in a wild pitch and two runs scoring. Replays indicate the pitch appeared to make contact with Chisenhall's bat; the play is not reviewable, the call was incorrect. At the time of the ejection, the Indians were leading, 4-1. The Indians ultimately won the contest, 10-7. This is Jim Joyce (66)'s first ejection of the 2016 MLB regular season. Jim Joyce now has -7 points in UEFL Standings (-5 Previous + 2 MLB - 4 Incorrect Call = -7). Crew Chief Jim Joyce now has -7 points in Crew Division (-7 Previous + 0 Incorrect Call = -7). This is the 153rd ejection report of the 2016 regular season. This is the 61st Manager ejection of 2016. This is Houston's 7th ejection of 2016, 1st in the AL West (HOU 7; LAA, OAK 5; TEX 4; SEA 2). This is AJ Hinch's 3rd ejection of 2016, 1st since July 3 (Ryan Blakney; QOC = U [Warnings]). This is Jim Joyce's first ejection since May 21, 2015 (Will Smith; QOC = U [Ilegal Substance]). Wrap: Houston Astros vs. Cleveland Indians, 9/8/16 | Video available via "Read more"